P sychedelic nihilism, save for the lonely quark gluon plasma, the original intermediary matter between nothingness and somethingness. Copernicus is a prophet/poet, a quasi-musical anti-mentalist who reduces everything to atomic theory. Since that may not conjur much of a mental image, think of Jim (Christopher Lloyd) from “Taxi” fronting the Velvet Underground after some really bad acid. Actually, don’t think of anything at all, since you don’t really exist (according to Copernicus) and therefore probably have better things to (not) do. The foundation for this music is Beat poetry, Captain Beefheart and the bizarre psychedelic spelunkering from the 60s (VU, The Red Krayola, etc.). I won’t kid you: this is jarring, bracing stuff that may just detach you from your current reality, so be sure to wear your theological gravity boots before disappearance swallows you into its black hole of alternate cosmology. The seven improvisational performances are inspired by a single vision; having made his life a work of art, art flows freely from the mind of Copernicus. The backing music leavens the intensity of the dense metaphysical matters that occupy his mind, alternating between free jazz (“Humanity created the illusion of itself.”) and VU’s gothic experimentalism (“12 subatomic particles”). When free jazz and gothic sounds are the light matter, you know you’re going into a dark place. As an antidote to dull reality, disappearance is fascinating. Just don’t look too deeply into it for life’s answers. 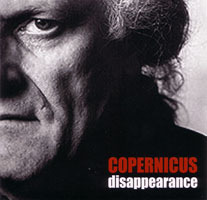 The concern for temporal things like punctuation exposes Copernicus to be more poet than prophet. This is a carnival ride of the mind; don’t fear the dark shadows, just abandon yourself to their terrifying potentialities for 70 minutes, and you’ll get your money’s worth. All lyrics by Copernicus. All music created spontaneously and instantly by the musicians.